There are now so many sizes, types and formats of audio interface available that it can seem well-nigh impossible to find the one that best suits your needs. We sort out the spec features that are really important. 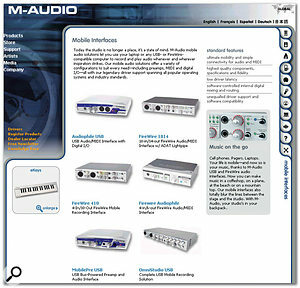 When I first started reviewing soundcards for SOS, way back in 1996, they were of the ISA (Industry Standard Architecture) variety, and could be a nightmare to install — being mostly pre-Plug and Play they required manual selection of their IRQs (Interrupt Request Channels), DMA (Direct Memory Access), and I/O (Input/Output) addresses, to avoid conflicts with other expansion cards and motherboard devices already in the PC. 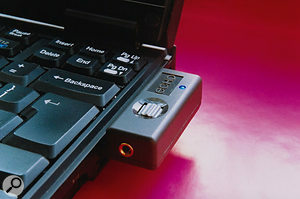 Fortunately, the twin advancements of Plug and Play and PCI (Peripheral Component Interconnect) cards made it far easier to install and configure a new soundcard, while laptop owners also had the one obvious choice of a PCMCIA (Personal Computer Memory Card International Association) card for audio duties. However, some PCI expansion cards still refused to co-exist with others in the same PC, requiring occasional card shuffling, and of course you still had to open up your PC and physically install each card into whatever expansion slots were still empty. What peripheral manufacturers wanted was a new interface that allowed you to plug in additional devices without having to open up the computer, and with the potential to keep chaining as many as you wanted, preferably without even having to switch off the PC before you plugged them in. And so USB (Universal Serial Buss) was born, although it initially had various teething troubles and its initial 1.1 version, with its 12 megabits per second (Mbps) transfer rate, had various audio limitations (more later on these and their cures). 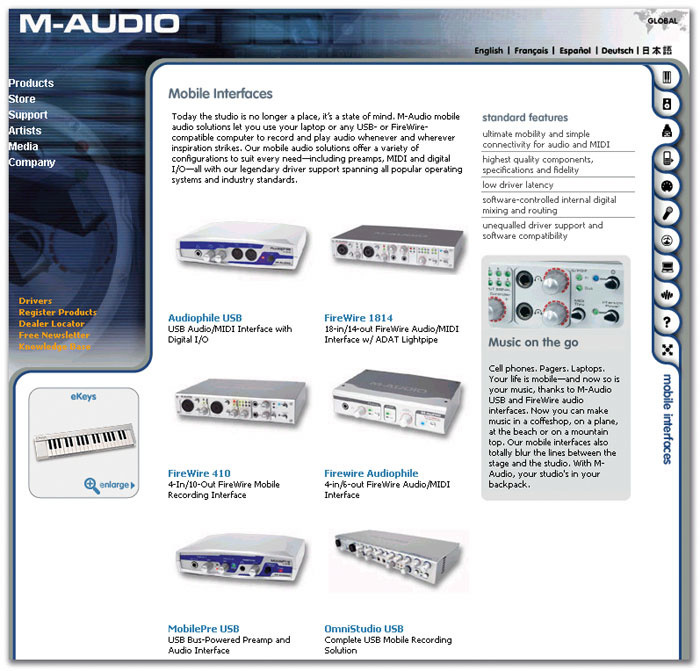 Like many manufacturers, M Audio have both USB 1.1 and Firewire audio interfaces in their mobile range. USB 1.1 is perfectly adequate for running a stereo in/out interface at the 24-bit/44.1kHz that most musicians still prefer, or 24-bit/96kHz for either recording or playback (but not both). Firewire is capable of running many more simultaneous channels if you need them.Shortly afterwards, Firewire (Apple's label for the standard also known as IEEE1394a, in honour of the Institute of Electrical and Electronics Engineers) appeared as a much more capable serial standard for those requiring a wider bandwidth of up to 400Mbps when plugging in a chain of external devices, only to be largely matched in performance by the second-generation USB 2.0 standard, with its support for transfer rates of up to 480Mbps. Now, of course, Firewire has sprouted another, faster version — Firewire 800 (aka IEEE1394b), which, as its name suggests, supports transfer rates of up to 800Mbps. No wonder so many musicians are confused when attempting to choose a new audio interface. Not only do you have to match the number of inputs and outputs to your requirements, along with any other preferences, such as digital I/O for plugging in your Minidisc or MP3 device, and MIDI I/O for plugging in an external synth and keyboard, but you also have to decide from up to five possible formats: PCI/PCMCIA (for desktop or laptop use), USB 1.1, USB 2.0, FireWire 400 and FireWire 800. Even worse, some of the online music technology forums are awash with misinformation about the differing capabilities of these different formats, and there's yet further confusion about some audio interface specifications. So in this SOS guide we're going to strip away the gloss and explain what's good, what's bad, what's worth paying extra for, and what's not. Let's start with the basics: matching your particular requirements with the set of features offered by various audio interfaces, so that you can assemble a shortlist. Fortunately, many more musicians now take the trouble to think things through carefully before getting out their credit card than used to be the case, but I'm still surprised at how many don't. The number of analogue inputs and outputs, in particular, is crucial to making sure your choice of interface won't have to be upgraded after a short time, but there's no point in paying extra for I/O features you'll never use. For any musician with a PC laptop, one of the huge advantages of a PCMCIA interface such as Echo's Indigo is its tiny footprint and lack of external PSU.If you only ever need to record a single stereo track at a time, or a couple of signals from mono mics for acoustic guitar and vocals (for instance), then you really only need a stereo soundcard — there's no point in spending more to buy one with eight ins and outs, however good other musicians say it is (it certainly used to be true that 'eight-in/eight-out' interfaces generally had more professional audio quality, but no longer). However, for recording a live band four inputs is the absolute minimum requirement, and eight is preferable. If you definitely need more than eight simultaneous inputs the most flexible approach is to buy several identical 8-in/8-out interfaces whose drivers support multiple hardware units (more on this approach later). If you have multiple external synths to record, there are several working approaches, each with its own strengths and weaknesses. Firstly, you could mix them externally using an analogue mixer, apply some hardware effects if required, using its inserts and send/returns, and then record the final stereo feed in one gulp using a stereo soundcard. This is the approach I normally use, and it's popular because most modern synths provide finished sounds with effects already in place. If you want the flexibility of being able to add software plug-in effects to each synth separately, you can (once again) use an external mixer during the composition phase, when you choose the most suitable synth patch and record and tweak your performance as a set of MIDI notes. Then record the output of each synth into your song one by one as a separate mono or stereo audio track, and add individual plug-in effects to them afterwards (the flexible approach). Only if you want to add software effects to each synth in 'real time' will you need to buy a soundcard with enough inputs to record each synth simultaneously (the luxury approach). 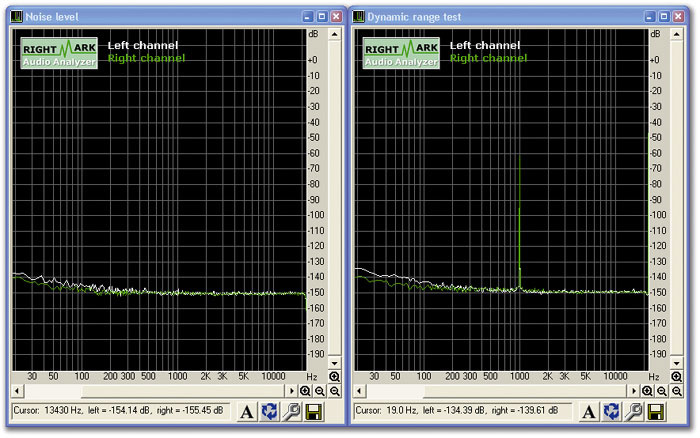 'Exotic' inputs are becoming increasingly common on PC audio interfaces. If you want built-in preamps to bring the low signal levels from mics, guitars, or record decks up to line level for recording into your PC, it may be handier to go for an interface with some already on board than to buy separate mic channels or an analogue mixer. However, guitarists should bear in mind that even if an audio interface provides a suitable high-impedance input, to avoid high-frequency loss, it still won't sound the same as when played through a guitar amp and speakers — unless you've got suitable plug-in effects, you may find it more effective to buy a dedicated guitar modelling interface such as a Line 6 Pod. Budget interfaces at under £200 aren't likely to include world-class preamps either (and you wouldn't expect them to), but they will certainly do the job. However, budget analogue mixing desks are now surprisingly capable, so as long as you buy one with channel insert points so that you can route each of its mic preamps to a separate input of your audio interface, this may still be a cheaper approach than buying an interface with lots of exotic mic preamps to record a live band. 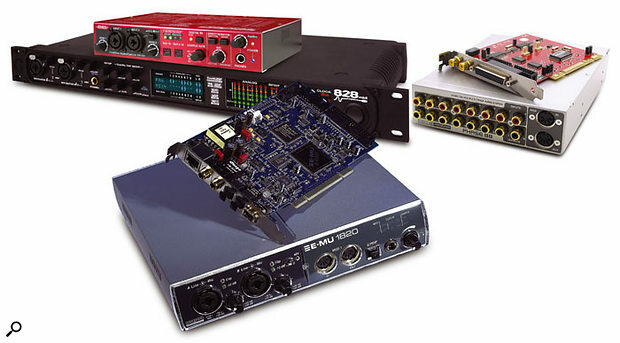 You'll need interface outputs for listening through loudspeakers (two for stereo, and anything up to seven for surround work, which is why some soundcards have two inputs but six or more outputs), and possibly further outputs for sending different monitor mixes to other musicians in a studio environment. Finally, if you want to patch external hardware effects into a software studio, your best bet is to allocate a further stereo input and output for use as effects send and return respectively (although if your effects boxes support digital I/O that may be the better option — see the next section). It's always useful to have a few spare inputs and outputs now, rather than having to sell and upgrade later on, but you can start small and expand smoothly if you choose an interface with drivers that support multiple hardware interfaces, as mentioned earlier. Various models from manufacturers including M Audio, MOTU, RME and Soundscape support up to four units, sometimes in versatile combinations from their range, so you can add further analogue inputs and outputs as you need them. If you have other digital gear, it pays to make sure that your chosen audio interface has compatible I/O, so that you can easily transfer recordings from one to the other. For anyone who hasn't yet tried this, a digital transfer provides two huge advantages over analogue. First, since the digital data from the source device is transferred to the destination device as a tream of '1's and '0's, it arrives as an identical clone, with none of the noise and distortion added by analogue circuitry. Second, there's no fiddling about setting up levels to avoid clipping or noise — you just start transferring the data. Signal/Noise Ratio is measured by establishing the maximum possible 0dB level, completely removing the test signal, and then measuring the remaining background noise level, as shown in the left pane. Dynamic Range is generally measured by applying a small signal of -60dB level, mathematically notching it out afterwards, and then measuring the remaining noise, as shown in the right hand pane. As you can see here, in most cases background noise levels should remain almost the same, which makes it easier to compare results from different manufacturers. S/PDIF (Sony/Philips Digital InterFace) generally carries a single stereo audio signal and comes in two completely different versions: S/PDIF coaxial uses 75Ω video cable terminated in phono plugs, while S/PDIF optical uses much thinner optical fibre cable. All is not lost if you want to connect digital gear of the other variety, since you can buy a converter box such as M Audio's CO2 or the Fostex COP1 at a cost of between £35 and £50. ADAT ports generally carry eight audio channels simultaneously down an optical cable, but with modern gear can often be switched to S/PDIF optical mode to interface with stereo gear, which is handy. Many musicians don't see the point of ADAT I/O if they don't have an external ADAT recorder, but it's a handy way to keep the audio interface price down while still supporting a large number of channels. If you want to add eight more analogue ins or outs later on, you can buy an external A-D or D-A box and plug it into that spare ADAT port. MIDI: If you need some MIDI Ins and Outs, many audio interfaces provide one of each, and a few provide two of each. These generally add very little to the price, and they give the reassurance that the audio and MIDI streams are being handled by one set of drivers, minimising any chance of conflicts. However, it's rare to find more than two sets of MIDI ports, so if your interfacing requirements are more ambitious you'll have to buy a separate four- or eight-port MIDI interface to handle these. Once you know how many inputs and outputs you need, and of what varieties, only then should you consider which of the various hardware formats is the best for the job, — or, for that matter, whether it will make any difference in your particular case. The oldest of the six main formats (PCI, PCMCIA, USB 1.1, USB 2.0, Firewire 400 and Firewire 800) are PCI and PCMCIA, and contrary to some people's views I still think they both have great strengths. 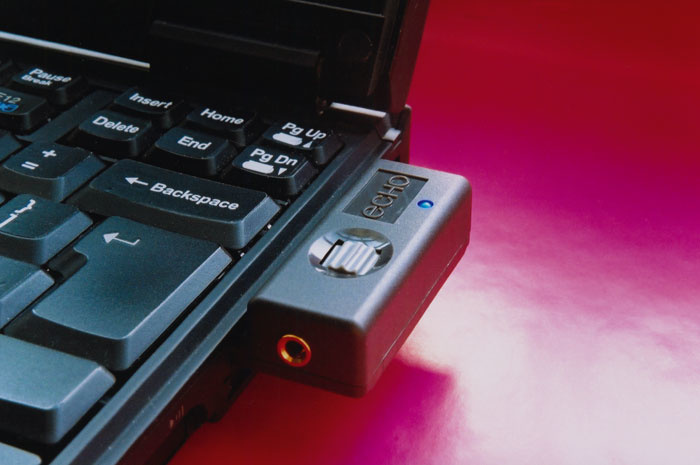 For laptop owners a PCMCIA solution is generally the most compact, while for PC desktop users the internally-fitted PCI card is the most mature and flexible format available. Internal conflicts between PCI cards are comparatively rare nowadays, as fewer and fewer devices insist on having their own unique interrupt, and in my own PC I've currently got three cards happily co-existing (an Emu 1820M running main audio duties, an Echo MIA running Gigastudio on its GSIF drivers, and a Yamaha SW1000XG for its MIDI synth). It's highly unlikely that you could mix and match USB or Firewire interfaces like this without running into problems. The four USB and Firewire formats all score in that they can be shared so easily between different computers, which is perfect for anyone who regularly uses a laptop or a desktop PC, but never both at once, or wants to share a single interface between a Mac and PC. They are also perfect for those who don't want the bother of opening up their computers for installation purposes, or for those who have no internal expansion slots left available. Hot-plugging (the ability to plug a device into an already powered-up PC) is also handy for some, but I've never seen this as being of huge additional benefit to musicians, since you have to have a USB or Firewire audio interface plugged in and powered up before you launch your music software anyway for it to be recognised, and unplugging it before exiting the application may also result in a crash. Another frustration faced by some musicians with more than one hot-pluggable audio or MIDI interface is finding that their driver entries can get shuffled within music applications, resulting in songs whose tracks get sent to the wrong device. Although they look quite different, both these plots are for interfaces with excellent Total Harmonic Distortion figures lower than 0.001 percent. You can see the 1kHz sine wave test signal at near maximum level, and the resulting low levels of harmonics that are generated by the interface at 2kHz (second harmonic), 3kHz, (3rd), 4kHz (4th), and so on. The difference is that the interface on the left has a 10dB better dynamic range, so its noise floor is also significantly lower.Moreover, recent research has resulted in a general recommendation to avoid hot-plugging Firewire peripherals altogether, after a few people suffered permanent damage to either the peripheral or the computer's Firewire port. And, while in theory Firewire supports up to 63 simultaneous devices, and USB up to 127, musicians have found (to their cost) that chaining more than a couple to the same port can result in conflicts. Those who have decided that the USB/Firewire route is the one for them face an even more confusing set of facts, rumours, and misleading comments. Some musicians regard USB as fundamentally flawed for audio and MIDI use (I even spotted one damning claim that 'USB is only suitable for mice'), but my experience doesn't bear this out. Admittedly, some of the early USB 1.1 interfaces caused no end of problems, partly due to flaws in the early USB chips in both the audio interfaces and in the PCs at the other end of the cable. However, these issues were resolved years ago, and modern USB 1.1 and 2.0 audio peripherals generally work very reliably. There's also a lot of snobbery about the slower USB 1.1, which is also unfairly dismissed out of hand by some musicians. It's perfectly adequate for a stereo interface running at the most common 24-bit/44.1kHz or 24-bit/48kHz formats, and only struggles for bandwidth if you want to record and play back simultaneously at 96kHz. If it fits your requirements, USB 1.1 is fine, and there are now lots of USB 1.1 audio interfaces to choose from at really low prices. 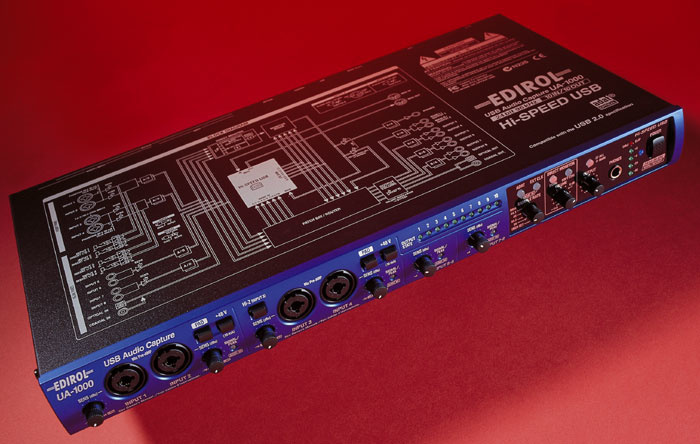 USB 2.0 seems to be stuck out on a limb, since so few manufacturers currently support it, but Edirol's UA1000 has proved this format's reliability for multi-channel audio interfaces, and other USB 2.0 products, such as Behringer's BCA2000, are slowly starting to be released. However, if you want an external interface with support for 24-bit/96kHz and plenty of channels, Firewire is currently the most popular choice. I suspect one of the main reasons for this is that for the manufacturer a USB 2.0 interface is PC-only (Macs don't currently support USB 2.0 audio), whereas a Firewire one can be used on both PCs and Macs. At the moment. some musicians are bemoaning the lack of Firewire 800 ports on modern PCs, but just as with the USB 1.1/2.0 argument, Firewire 800 is only required if you need to surpass the I/O requirements of the extremely popular Firewire 400 ports. Only if you require 56 simultaneous channels of 24-bit/192kHz audio, as available on a product like RME's new Fireface 800, do you need a compatible port. After all, both Firewire 400 and USB 2.0 are both already capable of running a huge number of simultaneous I/O channels. Many musicians are still confused about which interface input sensitivity and output level to use when faced with choices of 10dBV (consumer) or +4dBu (professional). It's easy to get bogged down in discussing millivolts and so on, but there are a few simple rules of thumb that should make everything easier to understand. Always stick to the '+4' option if you can, since this generally results in lower noise levels. If you can't get high enough recording levels with '+4' input sensitivity on your interface, and there's no -10/+4 switch on the source gear, switch to '-10'. Similarly, stick with +4 output levels unless any connected gear can't cope with these higher levels, in which case revert to '-10'. Some musicians study the specifications of their shortlisted audio interfaces to try to work out which one is the best. However, while specifications can play an important part in the proceedings, they are not the be-all and end-all; neither can they tell you exactly how a particular interface sounds. The most hotly quoted specification for any audio interface tends to be its dynamic range or signal/noise ratio. There's still a lot of confusion about these two terms, and this is hardly surprising considering each may be measured in a variety of ways. However, the way audio interface manufacturers measure them seems to be reasonably consistent, and using these particular methods the two figures also tend to be very similar with many products, which makes products that quote one or the other easier to compare. 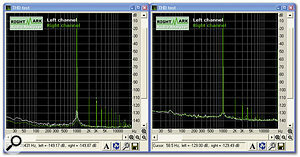 In audio interface terms, Signal/Noise ratio compares the maximum signal level that you can send to the interface (ie. that which makes the input meters just register 0dB) with the background noise level when no signal is present. However, some crafty soundcard manufacturers realised early on that they could achieve amazingly good s/n figures by automatically muting the output in the absence of an input signal, so that its background noise level was significantly lower. The audio interface dynamic range measurement therefore measures the background noise level in the permanent presence of a low-level signal (generally a 1kHz sine wave at -60dBFS), which is subsequently notched out using a filter. Dynamic range is therefore a slightly more reliable real-world test. You may spot some cheap soundcards with significantly worse results for their dynamic range than for their Signal/Noise (S/N) ratio. Edirol's UA1000 is one interface that, according to my ears, features a low-jitter clock — although, like most other manufacturers, they don't provide figures in the specification that confirm this. It's also one of the few USB 2.0 audio interfaces available, and its excellent reputation proves that this format is just as good for multi-channel audio as Firewire. Both figures are generally measured via an 'A'-weighting network, which rolls off the noise either side of its 3kHz centre frequency, in line with the sensitivity of the human ear. In essence, a 'dBA' rating reflects more closely how annoying we will find the background noise, with low-level hums below 200Hz and whistles above 10kHz being less obvious than hiss between about 1kHz and 6kHz. A dBA rating is generally a few dBs better than a 'flat' measurement. Despite the fact that most audio recordings still end up on a Red Book Audio CD at 16-bit/44.1kHz, most of us have abandoned 16-bit recording and playback in favour of the wider dynamic range possible with 24 bits. A typical soundcard will provide a maximum dynamic range of 96dBA at 16-bit, but well over 100dBA when using 24-bit, which allows us to worry less about taking our recordings to within a few dB of clipping, because the background noise levels are so much lower. However, when comparing the dynamic ranges of different audio interfaces, don't lose sight of the signals you'll be recording. If, like me, you still record the outputs of various hardware synths, the chances are that they won't have a dynamic range of more than about 80dB. If you're capturing a live performance via a mic, the background noise level of that mic and its associated preamp may already be higher than that of the audio interface, especially since it's difficult to make recording areas really quiet without extensive soundproofing. After all, as Hugh Robjohns said in SOS September 2004: "In most public venues I find the ambient noise floor is typically about 50-55dB below the peak level of a modest orchestra, organ, or choral group". So, while buying an interface with the lowest possible background noise is sensible, in the real world many musicians won't be able to hear any difference at normal listening levels between interfaces with a dynamic range of 110dBA and 120dBA. Moreover, I've recently spotted various musicians grumbling about the background noise levels of specific soundcards, when they were actually hearing digital nasties due to the the effects of a ground loop. As soon as they modified their wiring or introduced a DI box to deal with the problem, most were amazed at how quiet a background noise level of 100dBA was! It's also worth pointing out that switching to 32-bit recording and playback in your audio application won't result in an even larger dynamic range — the benefit of the 32-bit float format is massive internal headroom and no possibility of internal clipping when mixing together loads of tracks, but the interface will still have 24-bit converters on the input and output. Unless the world suddenly becomes a much quieter place, 24 bits will remain quite sufficient to digitise it. As well as low background noise levels, we also want our interface to have very low distortion levels, so that recorded waveforms emerge the same shape as they were when they went in and do not have their various harmonic components altered. 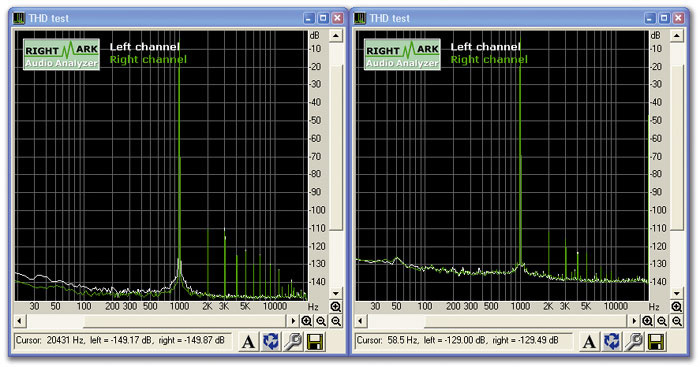 Distortion is measured by applying a large test signal, of typically -1dBFS (1dB below Full Scale), to either input or output, notching it out, and then measuring what remains as THD (Total Harmonic Distortion) + Noise (see screenshot). Many modern interfaces manage very low distortion levels (0.001 percent or better), but while you can certainly compare such measurements between products, they don't tell you how the harmonics are distributed; as an example, while three percent of second-harmonic distortion remains inaudible, even 0.01 percent of a high-order harmonic like the seventh can sound extremely nasty. While even budget audio interfaces are now beginning to feature 192kHz sample rates, there are still arguments raging on most audio forums about whether or not it's worth moving from a sample rate of 44.1kHz to 48, 88.2 or 96kHz. Many musicians stick to 24-bit/44.1kHz because they still create their music largely with hardware MIDI synths and soft samplers that themselves use 44.1kHz samples, so they see little point in moving higher, especially as they intend the final mix to end up on a 16-bit/44.1kHz audio CD. However, even those using electronic sources will probably find subsequent compression and peak limiting more accurate at higher sample rates, while EQ tends to sound far more analogue in nature and metering is more accurate. Those using soft synths that calculate or otherwise model their waveforms may also find they sound cleaner. For live classical and other acoustic recordings I suspect most serious engineers now prefer 24-bit/96kHz, particularly if the final recordings are for DVD release at 48 or 96kHz (depending on the number of channels), or 24-bit/88.2kHz for those destined for audio CD release, if this is available (since 88.2 and 176.4kHz sample rates aren't employed by any user medium, some audio interface manufacturers may leave them out as options). 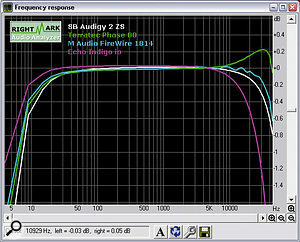 These higher sample rates should ensure that you capture the top-end transients, detail, and spatial localisation (the ability to pinpoint each instrument's position in a recording) more accurately than rates of 44.1 or 48kHz, and they arguably make high-frequency signals below 20kHz sound slightly more natural, by using more gentle anti-alias filtering above 20kHz. However, while mainstream PC magazines may mark a particular review soundcard down if it doesn't offer a 192kHz sample rate, I personally consider this option a huge red herring in the case of most audio interfaces under £500. If you can hear the improvement, use 192kHz, but bear in mind that the rest of the signal chain needs to be of extremely high quality to really exhibit any benefit over 96kHz. Remember, also, when choosing a sample rate for your projects, that at 192kHz every plug-in and soft synth you run will consume over four times as much CPU overhead, occupy more than four times the amount of hard disk space, and cut your potential simultaneous track count by more than a factor of four over 44.1kHz. When choosing an interface beware, too, of any sample-rate conversion behind the scenes. This will degrade audio quality slightly, as well as causing various frustrations (I discuss these in the PC Music FAQs section of the SOS Forums). Creative's SB Live! and Audigy's soundcard range are guilty of SRC (as is the old Emu APS card, but not the new Emu range). Windows itself can cause similar problems if you leave System Sounds enabled, since any digitised sound that it attempts to play of a different sample rate to your music app may force Windows own sample-rate-conversion algorithms to spring into action and remain active. All four interfaces shown here have a good frequency response that could be described as '10Hz-20kHz +/-0.5dB'. However, as you can see after zooming in to exaggerate the differences, their filter responses at the top end are all quite different, and they will sound subtly different too.There are a couple of things to watch out for with quoted frequency response figures. Those of the '20Hz-20kHz' variety are meaningless without some qualifier such as +/-1dB to show how flat they are over this range, and how much the response has fallen off at the extremes. Those with a qualifier such as +/-0.5dB generally indicate a top-end filter response with a few tiny ripples before the response tails off, while those along the lines of +0/-1dB (or just -1dB) are essentially flat to the extremes before falling off smoothly. However, the audible difference is generally extremely subtle. More important to those musicians wanting to use sample rates of 96kHz and over is the bandwidth of the associated analogue circuitry. I've noticed some interfaces whose analogue electronics offer a blanket '10Hz-22kHz -1dB' frequency response even when running at sample rates of 96kHz or 192kHz. In my opinion this makes extending the sample rate a little redundant — the whole point of running at higher sample rates is achieving a wider bandwidth to capture those transients and high-end detail more cleanly, so you should look for an overall -1dB point of at least 40kHz when running at a sample rate of 96kHz or above. Ironically, one audio interface parameter that I've found affects audio quality quite significantly is one very rarely mentioned in specs: clock jitter. However stable an oscillator circuit is, its frequency will still vary by a tiny amount over time, due to random noise, temperature variations and the like. Since the accuracy of the clock frequency determines how uniformly the samples are clocked out during playback, any timing variation will result in some sampled points being heard slightly early and others slightly late. The result is a less 'focused' sound that is particularly noticeable with high-frequency attack transients on drums and percussion. You also tend to lose subtle detail such as spatial information, so you can't listen 'into' the music and hear what's going on deep into a reverb for instance. Over the years I've reviewed various audio interfaces that sound noticeably more focused than others, so it surprises me that jitter figures aren't more widely quoted, except in the case of really expensive gear. RME are an exception in making a feature of their jitter figures — I first spotted this with the lower than 1000pS (Picoseconds) of their Hammerfall HDSP9632, measured at 44.1kHz using the optical input. I also persuaded Emu to provide me with figures for their 1820M, which are 795pS via the optical input and 596pS using the internal crystal clock. Both of these interfaces exhibit a clear, focused sound, and trawling back though the comments in my archived audio interface reviews I'm reasonably sure that other products with similarly low-jitter clocks include Aardvark's Direct Pro 24/96 and Q10, Echo's Layla and Mona, Edirol's DA2496 and UA1000, Egosys' WaMi Rack 24 and 192X, M Audio's Delta 1010, MOTU's 24 I/O, Soundscape's SSHDR1 and RED, and of course the Lynx One and Two. Perhaps the reason for the lack of audio interface jitter figures is that manufacturers are wary of quoting them when those of single fixed-frequency clocked devices such as CD players tend to be significantly lower (my budget Cambridge Audio 640C CD player, for instance, quotes lower than 260pS). As soon as external sync circuitry enters the picture, overall jitter performance tends to drop, even when using the internal clock option. However, given that internal clock jitter is so important to the audio quality of even budget audio interfaces, I hope any manufacturer whose products are mentioned above will be encouraged to release some figures in the future. Finally, before I end this section, it's important to note that you may not hear these subtle differences unless you have reasonable acoustics in your listening room — lots of stray audio reflections from desks, walls, ceiling and other gear may muddy the stereo image so much that they mask the improvements offered by a lower-jitter clock. First estimate the number and mix of inputs and outputs you need. Then decide which is the most convenient hardware format for your purposes, depending on what spare ports or slots you have (you can buy PCI adaptor cards that add extra Firewire or USB 2.0 ports to your desktop PC, and PCMCIA adaptors to do the same for your laptop, but it generally pays to keep things as simple as possible, and stick to ports that already exist). Check which models are available that meet these requirements, and stick them on your shortlist. Most musicians shouldn't end up with more than three or four. Now you can find out more about each model and compare their specifications. At this stage it can also be worth getting some user opinions on the SOS forums, to find out how others fared after making similar choices. Finally, before you get out your credit card, double-check that your chosen interface is compatible with your computer — not all products ship with both Mac and PC drivers. All SOS reviews give such details in the main title (eg. 'For Mac & PC', or 'For Mac OS X'), but this hasn't stopped a few Mac owners accidentally buying Emu's 1212M and 1820M (currently PC only). Take care!